This owl is part of the Lil' Trouble Teddy series. 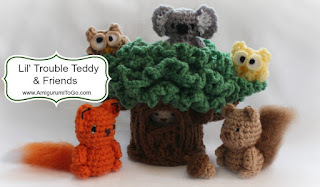 An entire series of tiny animals plus a tree for them to hide in. You'll find all the pattern links at the bottom of this page. All the patterns are free. There's nothing spectacular about this owl, it's really basic but cute. I designed the owl for it to sit on top of Lil' Oak the Hiding Tree. Nugget is a whole 2 inches tall! project to bring along to a doctor's apt or anywhere you'll be stuck waiting for a bit. They will keep your hands busy and your mind occupied! Read me ~> How to read the rows: Each row has a sequence as given below. Example: 1hdc then 2hdc in next st means repeat that sequence 1hdc then 2hdc in next st followed by 1hdc then 2hdc in next st over and over to the end of that particular row. The number inside the parentheses ( ~ ) is the number of stitches you should have at the end of that particular row. Use buttons, safety eyes, fabric, paint or felt for the eyes. Just remember anything you add could become a chocking hazard to small children. leaving a tail to sew up the gap. If you do not add wings, stuff body then sew the top edge closed and hide yarn tail inside owl's body. If you add wings, leave body without stuffing until you add them. Add a bit of orange or bright yellow yarn for the beak. You could also glue on a small piece of felt or even paint the beak on. Feel free to get creative! Hi!I love your lil'trouble teddies series! I was wondering if you still planned on releasing the elephant and mouse patterns too? Can't wait to make the whole gang! Lovely sweet little owls. Great to see them in the tree. Thanks for sharing th pattern. Your little tree is so beautiful! What a wonderful idea! Your little animals are precious too! comfort yarn is a 10 ply worsted weight. I list what I used so that you can get the same owl as seen. I love Nugget. Could you help me out on something. My ears on my owl do not look anything like your owls. They just barely stick up. Is there a trick or something that could help me? You whip stitch it closed, right? Yours are very prominent and mine are barely noticeable. Help.😱 Lol. are you doing dc's when the pattern says to? I didn't do anything special to make them stand out, the dc's make that area stand up higher than the rest of the row. Lol..... You are absolutely correct! I did not copy the pattern correctly. My owls look wonderful now. I have already made 5. Thank you so much for getting right back to me. just in case you missed it, there is a print friendly option at the bottom of all my patterns. can you paint the eyes? thank you so much for sharing your patterns and talent. i have trouble reading patterns so i love your video tutorials. do you think you will do tutorials for the owl and the fox. i want to make the animals before i try the tree, they will be a gift for my great nephew who will be 3 at the end of February. Hi Sharon, Love the whole series! Was wondering when you were going to come out with the lil acorn? awww! I'm so glad you found your way here. You're welcome and thank you for starting my day off with a huge smile. Happy crocheting!